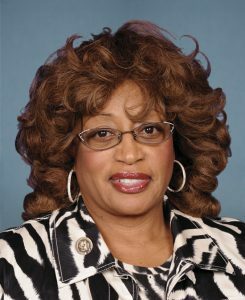 Former U.S. Rep. Corrine Brown was recently found guilty in Jacksonville of taking money from a charity that allegedly gave scholarships to poor students. Brown, 70, was convicted of 18 of the 22 charges against her, including lying on her taxes and her congressional financial disclosure forms. Brown, a Democrat who represented the Florida district that included Jacksonville since 1993, had pleaded not guilty to all of the charges, including fraud. She lost re-election last fall after her indictment. According to news reports, when the judge read each verdict she showed no visible reaction. Brown’s former chief of staff, Elias “Ronnie” Simmons, and the charity’s president pleaded guilty after their federal indictments for misusing the charity’s funds, and testified against Brown. Federal prosecutors said Brown and her associates used a charity called One Door for Education to bring in more than $800,000 between 2012 and 2016. Brown’s indictment said the Virginia-based One Door only gave out one scholarship for $1,200 to an unidentified person in Florida. Simmons said Brown ordered him to take cash and checks from One Door’s account. On dozens of occasions, Simmons said he was told to take out of One Door’s account the maximum $800 from an ATM near his house and deposit hundreds of it in Brown’s personal account. Sometimes he kept some for himself. Brown testified in her own defense, saying she was left in the dark about the goings-on with One Door’s money, and blamed the theft on Simmons.